Sunday Favourites at The Other Palace - Joe McElderry tickets at The Other Palace, London. 2019. 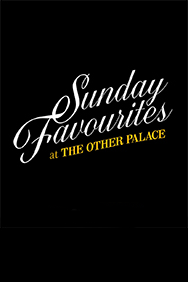 Find the best Sunday Favourites at The Other Palace - Joe McElderry concert tickets at The Other Palace, Inner London. The new series will see some of the biggest names in theatre headline an exclusive, intimate solo concert, performing a unique set of their favourite songs. Joe McElderry is a well-known English singer/songwriter. He won the sixth series of ITV's The X Factor in 2009 and then went on to release his first single "The Climb", which reached number one in the UK and Irish charts. He was also the winner of the second series of Popstar to Operastar in 2011. Apart from all his television achievements, Joe has had a very successful career on stage too. Most notably, playing the lead role of Joseph in the touring production of Joseph and the Amazing Technicolor Dreamcoat, Tommy in The Who's: Tommy and he appeared in Thriller - Live! alongside Macy Gray. He has released five top 20 albums - three of which have reached top three in the UK. As of 2014, Joe has sold over 2 million records worldwide. Approximate runtime 110minutes (including any interval). Presented by Lambert Jackson Productions. Sunday Favourites at The Other Palace - Joe McElderry tickets: The tabs above allow you to select between links to suppliers and date searching. Click on a supplier's logo to see their details and on the 'buy now' button to see and check the tickets on offer.